An Turkeya (Türkiye Cumhuriyeti) amo an usa ka nasod ha Asya. An kapital hini amo an Ankara. "Sovereignty unconditionally belongs to the Nation"
↑ "Motto". Gov.tr. 23 February 2013. Ginkuhà 23 February 2013. ↑ "Turkey". The World Factbook. Ginkuhà 9 February 2013. ↑ 3.0 3.1 "The Results of Address Based Population Registration System, 2013". Turkish Statistical Institute. 29 January 2014. Ginkuhà 6 September 2014. 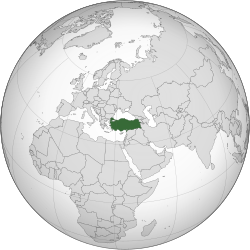 ↑ 4.0 4.1 4.2 4.3 "Turkey". International Monetary Fund. Ginkuhà 2 November 2014. ↑ "Gini Index". CIA. Ginkuhà 28 May 2014. ↑ "2014 Human Development Report". 14 March 2013. pp. 21–25. Ginkuhà 27 July 2014. Cîrlig, Carmen-Cristina (2013). Turkey's regional power aspirations. Library of the European Parliament. p. 8. http://www.europarl.europa.eu/RegData/bibliotheque/briefing/2013/120425/LDM_BRI(2013)120425_REV1_EN.pdf.